All aircraft fuel systems have filters and strainers to ensure that the fuel delivered to the engine(s) is free from contaminants. The first of these is encountered at the outlet of the fuel tank. A sump is used to encourage the collection of debris in the lowest part of the tank, which can then be drained off before flight. The actual tank outlet for the fuel is positioned above this sump. Some type of screen is used to trap contaminants attempting to flow out of the tank into the fuel system. Finger screens are common on light aircraft. They effectively increase the area of the fuel tank outlet, allowing a large amount of debris to be trapped while still permitting fuel to flow. Figure 1 illustrates finger screens that are screwed into a fitting welded in the tank outlet. Fuel tank outlet screens on aircraft with more complex fuel systems are similarly designed. 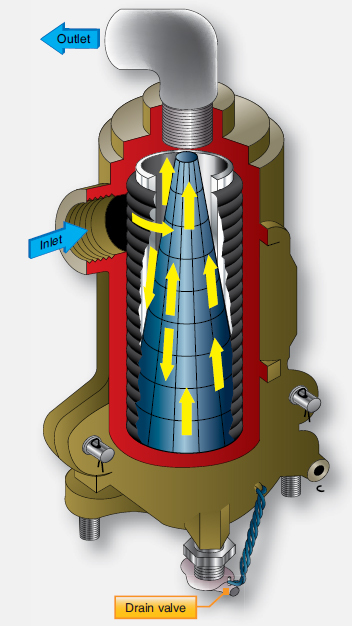 When in-tank boost pumps are used, the tank outlet strainer is located at the inlet to the boost pump. The screen’s large area allows debris capture while still permitting sufficient fuel flow for operation. 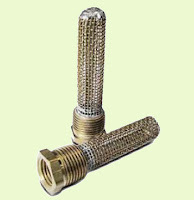 Regularly scheduled inspection and cleaning of these strainers are required. The main fuel strainer is often mounted at a low point on the engine firewall. The drain is accessible through an easy-access panel, or it simply extends through the bottom engine cowling. 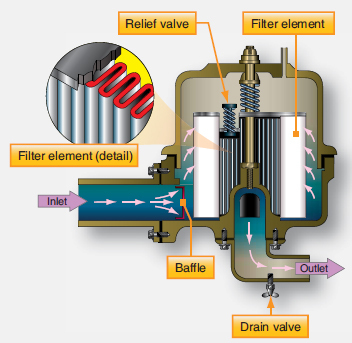 As with most filters or strainers, fuel is allowed to enter the unit but must travel up through the filtering element to exit. Water, which is heavier than fuel, becomes trapped and collects in the bottom of the bowl. Other debris too large to pass through the element also settles in the strainer bowl. Higher performance light aircraft may have a main filter/strainer. [Figure 3] On twin-engine aircraft, there is a main strainer for each engine. As with single-engine aircraft, a strainer is often mounted low on the engine firewall in each nacelle. Turbine engine fuel control units are extremely close tolerance devices. It is imperative that fuel delivered to them is clean and contaminant free. 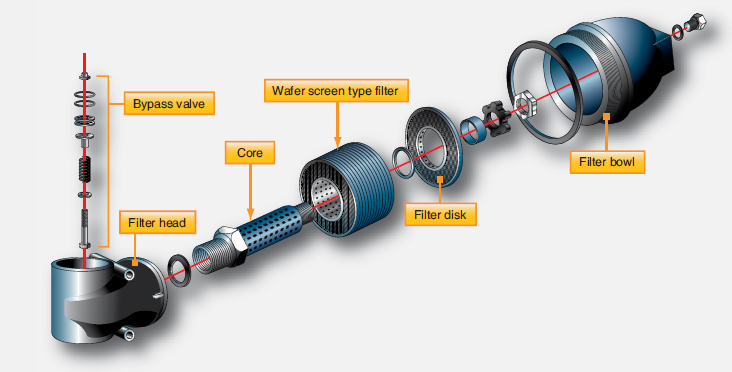 The used of micronic filters makes this possible. The changeable cellulose filter mesh type shown in Figure 5 can block particles 10–200 microns in size and absorbs water if it is present. The small size of the mesh raises the possibility of the filter being blocked by debris or water. Therefore, a relief valve is included in the filter assembly that bypasses fuel through the unit should pressure build up from blockage. Figure 5. A typical micronic fuel filter with changeable cellulose filter element. Indication of a filter blockage may also appear in the cockpit through the use of a bypass-activated switch or a pressure differential switch. The bypass valve physically activates a switch that closes the circuit to the annunciator in the first type. 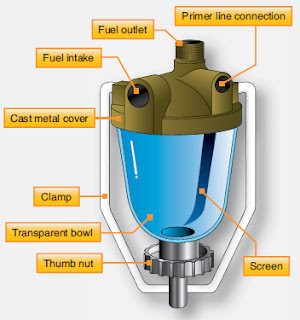 The differential pressure type indicator compares the input pressure of the fuel filter to the output pressure. A circuit is completed when a preset difference occurs. Thus, an indicator is illuminated should a blockage cause the bypass to open or the inlet and outlet pressures to vary significantly. Fuel temperature can also be monitored for the possibility of a blockage caused by frozen water.